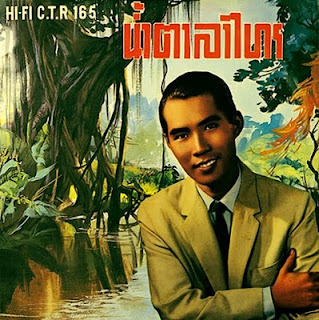 i'm very sad to report that this past week the great phon phirom passed away, at the age of 82. i thought it would be nice to honor his legacy by sharing one of my favorite luk thung albums, this collection of his earliest singles, dating from around 1962. phon was born into a theatre family from phra nakhon si ayutthaya, and from a young age was fascinated by the world of thai classical music. growing up, he studied the arts of the piphat ensemble and chinese opera, in addition to traditional thai vocal forms. after touring for a number of years with a traveling liké troupe, he was persuaded by famed chularat bandleader mongkhon amatayakun to apply his talents on the burgeoning luk thung stage. phon found a way to integrate the folk & classical styles he so loved into the framework of the latin-inspired pop styles of the day, and became an inspiration for generations of future stars. since the early 80's, however, phon had left the entertainment world behind to join the buddhist priesthood, taking the monastic name phra punyawangso. he lived out his last days at wat rattanachai in his home province of ayutthaya. I can tell from the album cover alone that I'm going to love this. Sorry to hear about his passing, but at least his music lives on. Many thanks for the introduction! love the artwork!! true history about mr. phirom.. thanks! !